Hope your week is going fabulous!!! I know a couple who is going to have a baby within the next few months and even though I already know it's a boy, I'm making a pair of cards for a boy and a girl because I just couldn't resist. 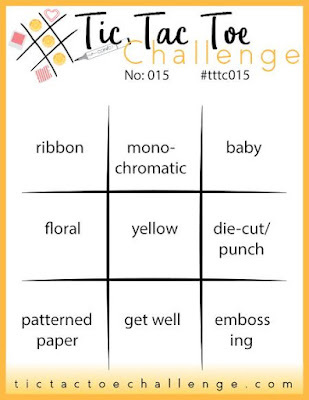 For this week's challenge I went with the far right column down: baby - die cut or punch - embossing. One thing I need to forewarn you about is the die I used to cut out the window (aperture) in the card is from the August 2017 Hero Arts monthly kit and unfortunately they have been sold out for some time. Normally I avoid using products that you cannot get, but I went ahead this time with the thought that a lot of this card is the technique and look and if you have another fancy die or SVG file you could cut with an electronic cutting machine, then you're almost there. I've linked to the kit here just in case you'd like to see what these kits are like. This is the first one I've personally purchased and I have to say that I really love it. The good news is that the baby on the moon is a digital stamp that I purchased on Etsy from Pink Gem Designs which is available. 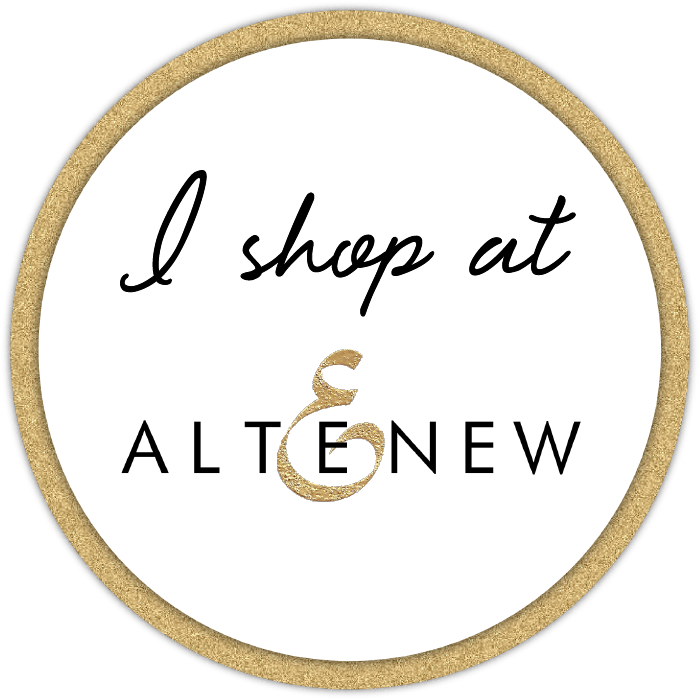 Affiliate link disclosure: all products used here were personally purchased and I provide these links at the end of this post for your convenience. If you use any of them to purchase the supplies I may make a small commission at no additional cost to you. 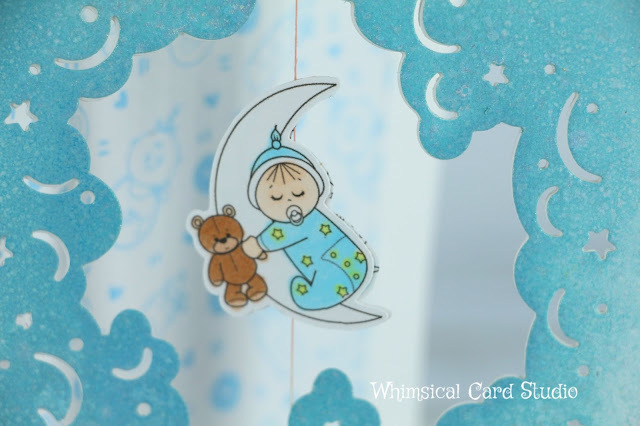 This helps support my blog and bringing you more fun card inspiration. Both cards are A2 sized. The trick to doing this card is to cut a panel ( 4.25" x 5.5") for the front as well as a card base (5.5" x 8.5", scored in half) together. To emphasize: Cut both the panel and the front side of the card base with the die at one time to ensure the window lines up correctly. 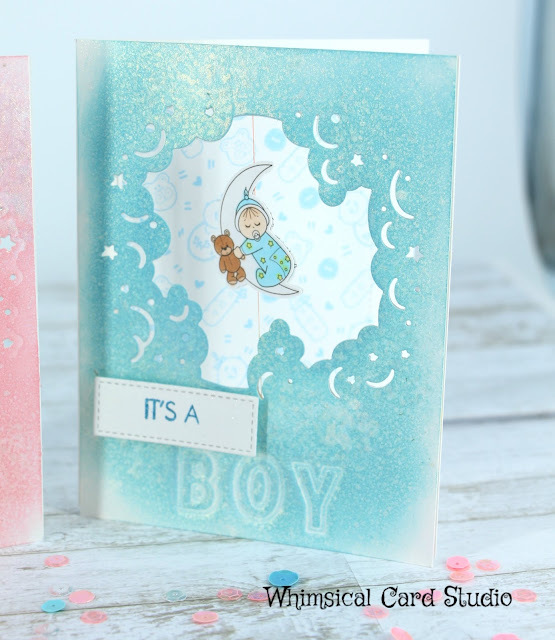 the front card panel will also help to create a sandwich to hide where the thread holding the baby spinner when the card is opened. 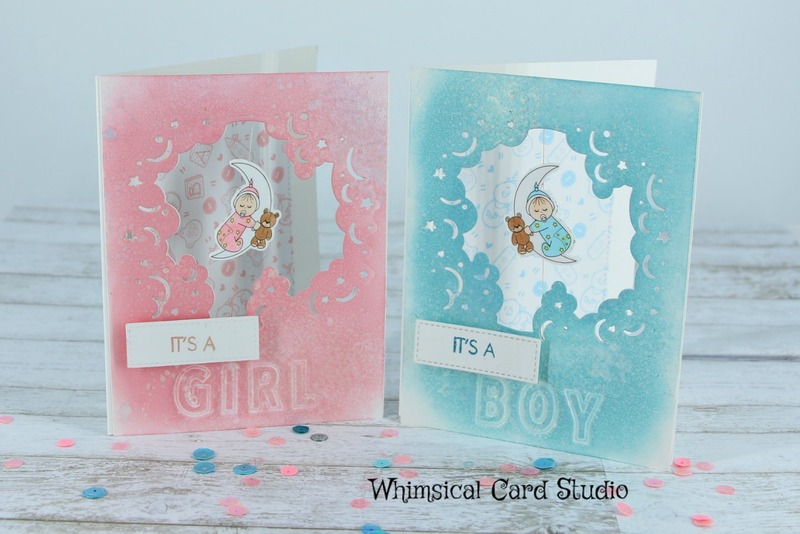 The front of the card panels were white to start with - The words "girl" and "boy" were created by using these Concord & 9th double cut alphabet dies using an embossing mat & impression plate with the Big Shot instead of a cutting plate to impress the word into the paper. this was done before coloring the paper. I do strongly recommend doing the embossing first so you have an outline for the letters when adding the color on top. I used an ink applicator tool to add color using Distress Oxide inks, but not completely cover the white. I started in the middle and worked my way out, using circular motion and a light hand as I got towards the outer edges. I sprayed the front card panel with the lighter of the two mists that came in the kit - it's a high shimmer spray that has both an iridescent and gold finish. Very similar to the Angel Mist sprays so that would not be difficult to replicate with a wide variety of sprays, including some DIY's that I've seen on the internet. I took another photo to show off the gorgeous shimmer. I don't use digital stamps very often and one main advantage is being able to resize and flip the orientation of the image in a word processor program like Microsoft Word, which is what I used. I sized the image at 1.25" high leaving the proportion in place to take care of the width automatically. I used a feature in word to flip the image horizontally and printed out several copies of both orientations on an 80# piece of Neenah Solar White cardstock since I planned to color the image with Copics. I colored two images per card, one of each orientation per color scheme. At this point the images could be fussy cut (or as I did using the Brother ScanNCut machine) and glued the two pieces together with a piece of thread in the center. Using a liquid glue will give you time to align the two die cuts. Mine could have been aligned better, but as they say, do as I say not as I do lol. At this stage I added Be Creative double sided tape at the top of the die cut panel (the one just colored) on the inside above and below the window so the thread would have a strong adhesive and not come loose. I then used liquid glue adhesive to attach the front panel to the card base, being careful to align the die cut window with the card base. On the inside of the card I added a rectangle piece of patterned baby themed paper I've had in my stash for many, many years. I used a rectangle die to get a precise cut. That way the spinner isn't showing up against stark white as a backdrop. 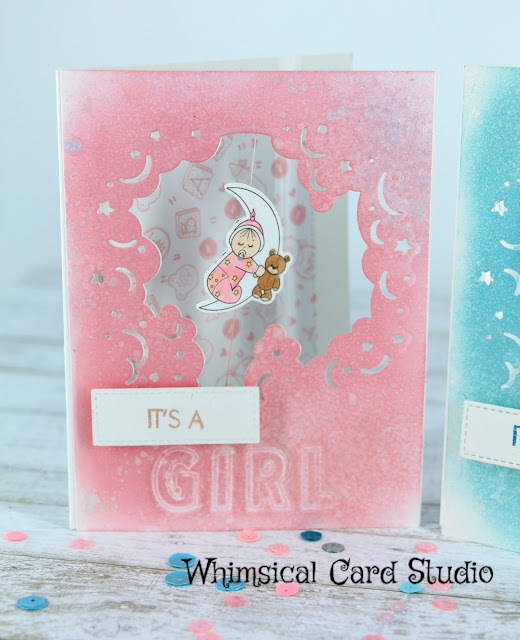 An additional sentiment could be added on the inside of the card on either the lower part of the patterned paper or on the inside of the die cut panel. To complete the sentiment on the front of the card I used "It's a" from this Honeybee Stamps sentiment set embossed on white cardstock and die cut with a small rectangle stitched die from My Favorite Things. 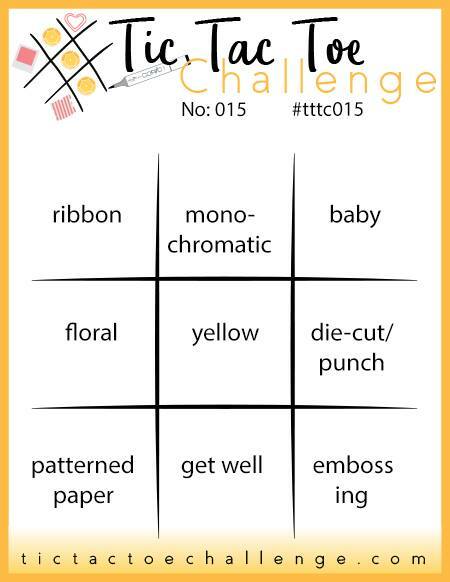 The rectangle die set is one of my most used items in the craft room. 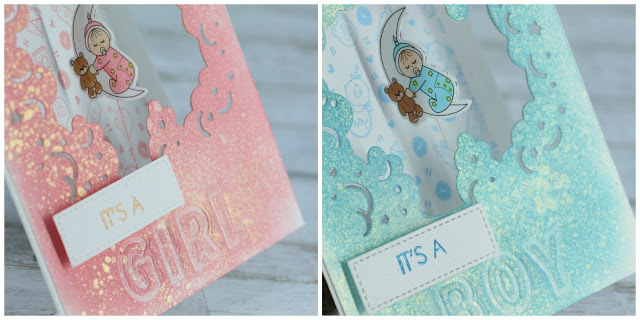 For the pink card I used a rose gold embossing powder and on the blue card I used a blue embossing powder. I think both would be equally nice with a gold or silver embossing powder in place of what I used here. I popped up the die cut sentiment on pop dots and placed above the embossed word and that completed the card. If you'd like the spinner in action, I will be posting it on Instagram and as a bonus, there is going to be a giveaway on my Instagram soon so now's the time to connect with me so you don't miss out!!! Thanks Teresa! I want to try this. I think I'm have to use a generic die cut like a circle and stamp on it as I don't use digi stamps. One question, what kind of thread do I use? Just regular thread or wire thread? Thanks! 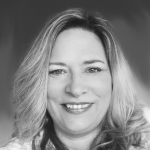 I just used some regular cotton thread - good feedback since I didn't even address that detail Stefanie! Thanks for stopping by.